Nine photogenic young people, partying their hearts out at a cabin in the woods. What could possibly go wrong? 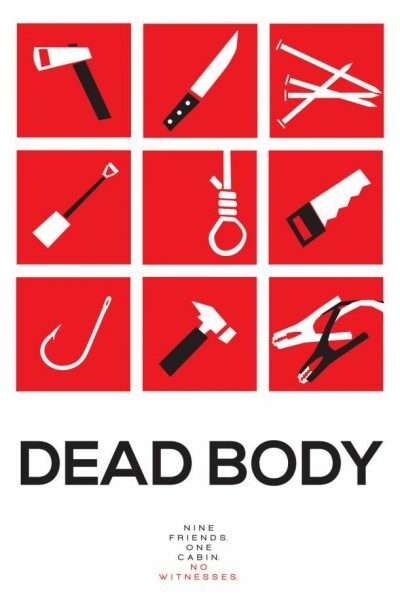 Well, maybe it’s just me, but I think you are probably asking for trouble when you start playing a parlor game called “Dead Body”. One person, drawn at random, pretends to be a murderer and “kills” other participants, who try to figure out the perpetrator. Such fun! Nobody – except the party-goers – will be surprised in the slightest to find out that someone is taking the game literally, and has appointed themselves as the murderer. Three bodies are discovered in an upstairs bedroom, and the fun times suddenly aren’t so fun any more. The film begins with Ilsa (Brun), the apparent ‘final girl’, facing off against and apparently recognizing the killer, then flashes back to the arrival of the various guests – wanted and unwanted. It isn’t exactly a novel scenario, and nor are the characters particularly fresh either. Indeed, they might as well be wearing neon signs: “the stoner,” “the creepy one” or “the nice guy”, archetypes which were largely cliches when Scream came out, and haven’t exactly improved with age. However, what the script does particularly well, is create and sustain an atmosphere of increasingly hysterical and self-destructive paranoia, as the party of nine turns in on itself. This may be the first genre movie I’ve seen where the victims end up offing more of themselves than the killer. There is also a good sense of progression to the deaths. Apparently deliberately, the first couple of victims are dispatched in ways that are almost trivial. However, the longer things go on, the nastier and more brutal things become, to the point where even hardened horror fans like ourselves were wincing. Not necessarily uber-gory, note; this is as much the product of things like sound design, as torrents of blood. This probably reaches its peak where a survivor is desperately seeking ammunition for their nail-gun. Except, the only ones available have previously been embedded into someone’s head, and need to be dug out. With their fingers. Well played, film-makers. Well played. I’ll tolerate a certain lack of imagination in characters when, as here, the effort has clearly gone somewhere else. The motivation for the killer makes a surprising amount of sense too – certainly better than most explanations. It’s directly mentioned early on, but you have almost no chance of spotting it, until you’re reminded in the climax. In style and approach, as well as the overall sense here of morbid wit, this is not a million miles removed from Scream Queens, the “sorta spin-off” from American Horror Story on Fox [though Ilsa makes for a considerably more likeable heroine than Chanel Oberlin]. Much like that series too, this movie seems to improve the further in you go. What initially feels like little more than another bunch of over-aged teens being offed, turns out to have more than its share of unexpectedly horrific pleasantries.